Vegan activists have been accused of ‘terrifying’ schoolchildren by ‘barbecuing’ a dog in the middle of a busy street in a protest against eating meat. 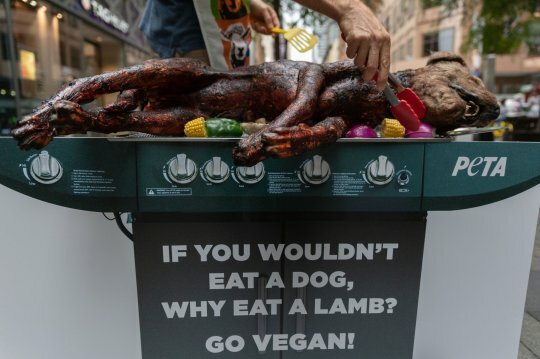 The Peta protest – involving a prop dog – was designed to cause outrage and asked people: ‘If you wouldn’t eat a dog, why eat a lamb?’. It argued that equally sensitive and intelligent animals are forced to endure suffering when they are bred, raised and killed for the meat industry. ‘This is called speciesism – a form of discrimination based on nothing more than species – and like all forms of discrimination, it cannot be justified. ‘As humans, we instinctively feel compassion and empathy for animals, but we’re taught that it’s OK to enslave and eat some of them, without a second thought as to who they are as individuals.’ The stunt was carried out at Pitt Street Mall in the centre of Sydney as millions of Aussies are preparing a big barbecue to celebrate annual Australia Day festivities on Saturday. Peta hope people will reconsider what they cook this year after showing a chef grilling the domesticated pet alongside some vegetables. THIS IIS DISGUSTING VEGANS YOU HAVE NOT DONE YOURSELVES ANY FAVOURWS AT ALL! Sorry phone ringing inbetween…Both valid view points…thats why we set the blog up so issues can be spoken about. Unfortunately it is a sad fact that farm animals probably wouldn’t exist at all if everyone became vegan. Can’t imagine them being kept as pets by farmers. So what is the answer?